Water is essential for life. You can only survive a few days without it. Being hydrated is so essential for health, I could argue that water is the most essential nutrient, period. After all, water is needed for every cell and function in your body. Water is a huge part of your blood; it cushions your joints and aids digestion. It helps stabilize your blood pressure and heart beat. It helps to regulate your body temperature and helps maintain electrolyte (mineral) balance. And those are just a few of its roles. Dehydration can impair mood and concentration, and contribute to headaches and dizziness. It can reduce your physical endurance, and increase the risk for kidney stones and create constipation. Extreme dehydration can cause heat stroke, especially in hot weather. When you’re focused on your work, or zipping between tasks with little down time, you might forget to drink water. It’s true that even though you might not feel thirsty, your body still needs water for proper hydration. In fact, water will help keep your mind sharp so you can focus on your tasks. However, there are conflicting opinions as to how much water to drink. Is there a right amount for everyone? What counts toward water intake? One guideline that no doubt you’ve heard is the "8x8 rule." This is the recommendation to drink eight, 8 oz glasses of water every day; that's about 2 liters of water. Like any nutrition “rule,” a one size fits all approach is not going to work for all cases. The 8x8 works better as a guideline, than a hard and fast rule. If you’re drinking way less than 8 glasses of water per day, it might be a good idea to get as close to the 8 glasses as you can (especially if you’re drinking coffee and alcohol daily as well). Now, many health professionals recommend drinking according to thirst. 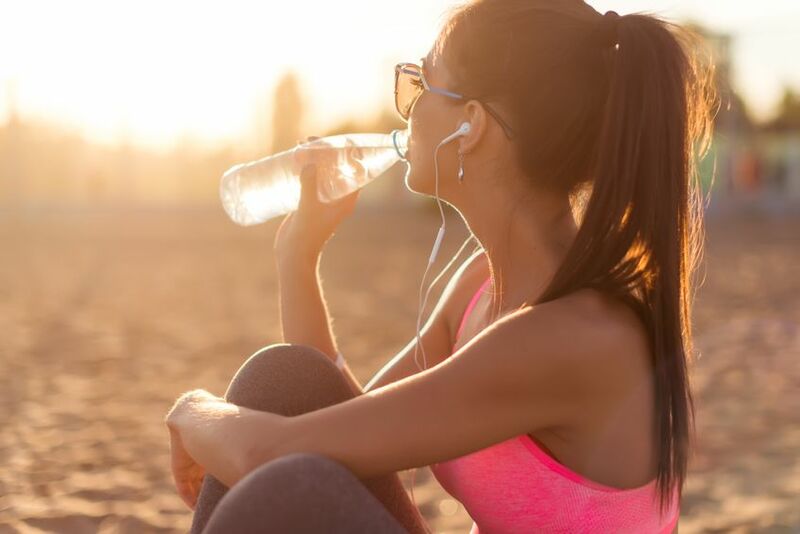 The danger with gauging your hydration based on thirst, is that in order to tell whether you’re thirsty you need to be paying close attention to your body. You also need to have water on hand. It’s true that humans have complex hormonal and neurological processes that are constantly monitoring how hydrated we are. And for healthy adults, this system is very reliable, and shows up as thirst. But what happens for many of us when we’re immersed in our day-to-day activities, is that we stop listening for our body’s cues. Or sometimes we know we’re thirsty/hungry, but aren’t prepared with water or food on hand so we put our needs on the back burner. Pay attention to how dark and concentrated your urine is. The darker your urine, the more effort your body is making to hold on to the water it has. Urine is still getting rid of the waste, but in a smaller volume of water, so it looks darker. A well-hydrated body produces urine that is very faint yellow, almost completely clear and colourless. Keep in mind that if you’re taking B vitamins, this could alter the colour of your urine. There are a few other things to consider when evaluating your hydration status. If you’re sweating a lot, or are in a hot/humid climate, you’ll need to drink more. Breastfeeding moms, elderly people, and people at risk of kidney stones need to drink more water too. So do people who experience vomiting and/or diarrhea, as both can quickly dehydrate our bodies. So use the one size fits all 8x8 rule as a guideline, and pay more attention to your body’s subtle cues for water. Water is the best choice, but if you're not drinking pure water, consider the effects that the other ingredients have on your body. Drinks containing sugar, alcohol, and caffeine will have effects on the body besides hydration. Sugar can mess with your blood sugar balance. Alcohol can make you feel "buzzed." And caffeine can keep you awake. Let's talk a bit more about caffeine for a second. Caffeine is the infamous "dehydrator," right? Well, new research is saying otherwise. While caffeine may make you have to go to the bathroom more, that effect isn't strong enough to negate the hydrating effects of its water. So, you don’t need to counteract your daily cup(s) of coffee and/or tea…but you do need to know that water is a better choice for a hydrating beverage that has better overall health effects. Think of it this way, if you’re hungry are you going to nourish your body by drinking a chocolate bar, or vegetables and lean protein? The coffee vs water debate is similar. Water is your best source of fluids. But other liquids help too. Just consider the effects the other ingredients have on your health as well. And many fruits and vegetables are over 80% water so don't forget about them. Next Next post: Salt: Delicious, but is it Healthy?